castle | eat. drink. cook. travel. DC’s parents brought back two bottles of Irish whiskey from a recent trip and we were excited to finally try whiskey. The friends who introduced us to whisky are fairly staunch Scotch single malt fanatics and woe betide anyone who dares to spell whisky with an E. Folks, they drink whisky and would never be caught dead with whiskey. Beware the difference! 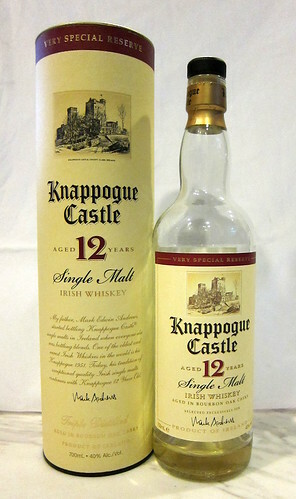 Now we plebs drink anything whiskey, E or no E. And this is what I think of the Knappogue Castle 12 year old (40%). For a fairly young whiskey, it does really well on the complexity front. The bright yellow-orange liquor gave a first wash of sea salt over the tongue, followed by light smoke and plenty of orange peel and grass. I liked how it was hard and robust, yet had a good whiff of vanilla, with some floral honey notes. I think the hardness I perceived came from the mineral aftertaste that I love so much in white wines like chablis and muscadet. It’s great stuff considering how young it is. I wonder how the older ones fare. 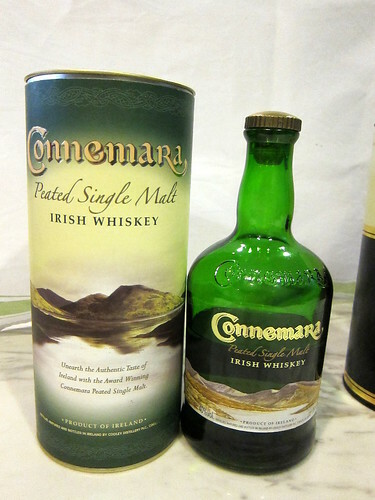 Next was the Connemara Peated Single Malt (). DC likes it a lot more than me. I’m not sure about it as I feel that while it’s got a lot of peat that I like, it’s rather unbalanced. It’s as if the whiskey was turbo-charged on peat and has little else to offer. Sadly, it doesn’t make my to-collect list. Puerto Galera was the first stop for the first real backpacking leg of my trip. 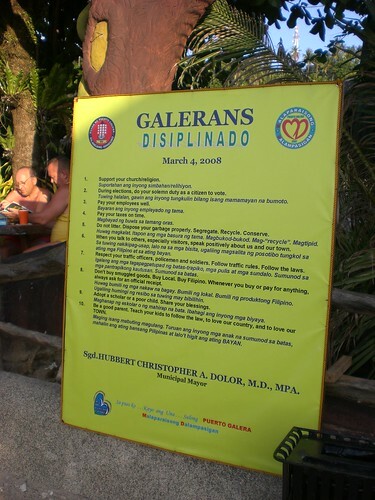 I eased into it by joining a group of dive friends to Puerto Galera and Donsol before heading off on my own. It’s a dive town strung out against the coastline, with most things of beauty being the coconut trees leaning gracefully over the water towards the newly painted outrigger boats. Looking out to sea on one of those bright, almost unbearably sunny days, it really looked and felt like paradise. The town itself was nothing much to shout about. 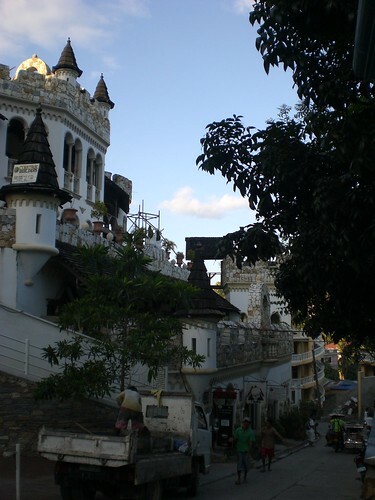 The most interesting thing about the town in the day time was this faux medieval castle masquerading as a high end hotel. One afternoon, we pretended that we were looking for a room and went in for a look. If you’re up for dark hardwood floors and claustrophobic winding staircases, this is the place to be! A nice gimmick. 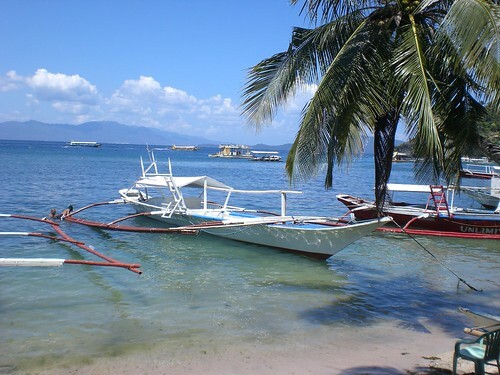 The other interesting thing about Puerto Galera were its many nightspots and drinking places, all populated by an incredible number of pole-dancing girls. This, contrasted against the rules for the town. (Click on the picture for a larger image to read each one.) I suppose it comes under Rule #10, teach kids to love your town. Well, we came here for the diving and it was superb! It helped greatly that we had some very excellent dive guides who were professional, friendly and gave some of the most comprehensive briefings I’ve had. Here’s Oying, the head dive guide, with one of his beautifully drawn maps of the dive site. Too bad I don’t have any pictures of the diving as I’d not bought my underwater camera and housing till much later. I’ll have to leave you to go there yourself first. Yes it’s a copout, so you’ll have to check out my next post for more interesting stuff.